If you've been searching for TV aerial fitters in Liverpool who can assist you with the installation of aerials and digital TV equipment, then you're in the right place because we offer low cost but high quality services across Liverpool. We can install, fit and upgrade aerials and TV equipment such as set top boxes, and can fit extra aerials sockets in your home so that you are able to watch digital TV throughout the house in Liverpool. Get in touch with us for a free estimate! 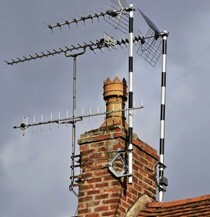 Problems with aerials in Liverpool? We can assist with any aerial issues in your Liverpool home quickly and efficiently, and what's more, we don't charge a fortune for our quality services either! So if you want professionals to help with your TV systems, call us now and get a free estimate to see how little we charge! You can reach our TV aerial fitters on 0151 434 4787 and they will come to your home to get your TV issues sorted and to make your home a more enjoyable place to be.